Lucas Oil Racing Feedback? :: For anyone participating or considering participating in any driving or racing school, here is the place to ask questions and share your experiences. It may be blasphemy on a Skippy Forum but I saw Facebook photos of some Forum members who participated in the October 2016 LRP race weekend run by Lucas Oil School of Racing. Any feedback, good or bad about the cars, event organization or the coaching? I have more faith in the opinions of our Forum members than random people on the web. Last edited by dalyduo; 04-14-2017 at 04:32 AM. Re: Lucas Oil Racing Feedback? Sorry for the delay in getting back. As you know... It's been very quiet around here. You did see most of the former Skippy masters at that LRP Lucas Oil School of Racing event. The cars are brand new Formula Fords that have MX-5 motors, paddle shifters with auto blip, data acquisition and smarty cams in all the cars. Many younger drivers in addition to the Skippy masters are also moving over to Lucas. At the last race at PBIR two cars qualified P1&2 in the high 1:30's Then there were 10 cars within 7 tenths of a second from 1:31.0 to 1:31.7 then 3 cars in the low 1:32's. So the young drivers are quick and the cars equal. The Lucas series is run by Todd Snyder and Randy Buck who used to run the Skippy Nationals and regular race series with some of the best ex-Skippy instructors working corners and giving data feedback. The cars are fun to drive, nicely balanced and less tail happy then the Skippy cars. They are about to switch to slicks but the all season Cooper tires currently used are low grip and very predictable. Having data and video in all the cars means your learning curve is improved by seeing your best efforts compared to ultimate tester or competitor laps. The video is also a great teaching tool and argument settler if contact happens. I'm enjoying racing their cars and being at their events. I would absolutely recommend you check them out with no reservation. Sadly SBRS was recently evicted from their Road Atlanta base office and Sebring shop. They owe money to all the tracks and many of their workers. A few devoted people are still showing up to run programs but some are owed large sums and others won't show up unless paid upfront. The school also recently lost it's SCCA accreditation. There aren't enough knowledgable mechanics or parts to properly maintain the fleet and after a series of brake failures, two of which I experienced, I decided my safety was at risk and choose to no longer drive their cars. The good people still trying to put on the show aren't getting the financial or managemnt support required to do their jobs. It was a sad day but I felt I had no choice. SBRS is in the rear view mirror while the Lucas Oil School of Racing would appear to be the future. Last edited by dalyduo; 04-14-2017 at 05:42 AM. Thanks for the info Pat. I have felt something was not quite right for the past few years. Running out of wings at MRLS and then multiple cars repeatedly breaking down this past December at Palm Beach International. I'll check out the Lucas Oil School site and join you guys for some fun. HOLY MOLY!! I disappear for only a few years and upon my return I find the (skippy) world in tatters! Whouldathunk?! A big non-smiley face emoji inserted here, please. I was ok leaving this site under the skippyforums name as a resource for new racers and as a spot to remember great memories for old ones, with the hope that Skip Barber (the product/company) might make a comeback before the brand becomes damaged beyond repair, or worse, irrelevant. I think at this point both seem to have happened, so not much hope now, is there?! I just started changing the site back to teamjuicyracing.com, even though I'm already over-saturated with my current work. Love and miss you all, especially you Pat! One more thing.. if there are any major creditors of SBRS that are interested in taking over and turning her around, get in touch with me. I changed the name of this site and one week later Skippy files for bankruptcy... coincidence? Hmmmm.. I haven't heard much about Lucas Oil School of Racing, but I do know that their cars are not appropriate for beginners as well as experienced racers. Their cars used to be on threaded tires, which was fine, but they they decided to move to racing slicks without reinforcing several suspension components. What I'm getting at is they break constantly from normal wear and tear and they do charge crash damage, even for the 2 day novice school :0!!! I have personally taken the 5 day school from the Bertil Roos Racing School and was very pleased. Their cars are built like tanks and rarely break from normal wear and tear. You are either completely misinformed, a shill for Bertil Roos, or both. Based on your statement you do know absolutely nothing about the Lucas School. 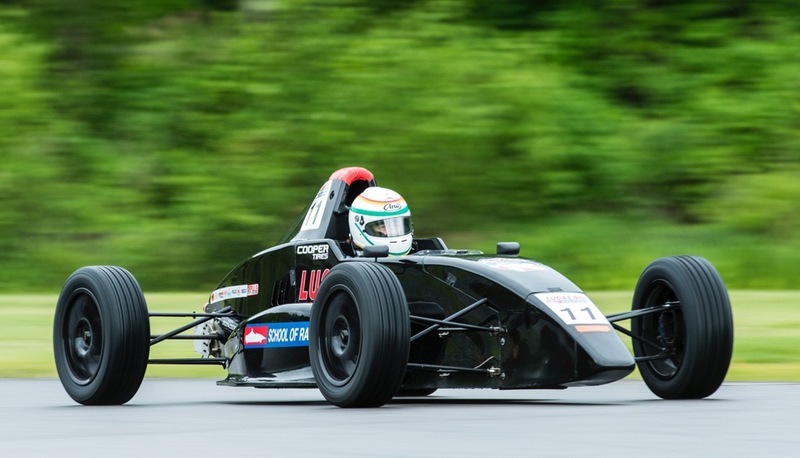 The Lucas cars are brand new state of the art Formula Fords and completely appropriate for beginners having paddle shifters with auto blip that don't require drivers to know how to shift manual transmissions. (Many students now show up at racing school with little or no clutch experience.) They are easy to drive, nicely balanced and are not shod with slicks as you incorrectly suggest they are. Slicks have never been used to this point in the race series or schools but will be integrated into the race series in the near future. Either way their use is irrelevant to the experience of a racing school other than slightly higher grip levels. The cars were designed to race on slicks so using them in no way requires reinforcement of suspension components and to suggest doing so causes failure of parts is libelous. The question I'd have about Bertil Roos is how old are the Roos cars and when were their frames and suspension components last magna-fluxed for cracks? If they are built like tanks one can only assume they drive like tanks as well. The Lucas programs are run by administrators and instructors with decades of Skip Barber Racing School experience teaching both schools and running race series, so if your serious about exploring a career in racing, or want to try a racing school or gift one to a loved one there is no higher quality place to go. I ran a couple of lapping days at Lime Rock recently and had a ball, also just came back from the race series event at Atlanta Motorsports Park with a masters trophy. How about a picture of you in the Roos tank Mitchel? Last edited by dalyduo; 06-20-2017 at 01:19 PM. Care to back your comments up with facts? The Lucas Oil School cars are just over a year old, and are based on a design that is winning races in various championships across Europe, and was designed from the get-go to run on slicks. And seeing how the slicks haven't yet been installed on the Lucas Oil School fleet, I'm curious to find out how they are "breaking constantly". This has to be the worst first post in the history or Team Juicy Racing. "Boo, creepy foot doctor. Hooray beer!"